I am a most definitely a breakfast person. My Dad says when I was little my Mom would order something off the adult menu and I would order something off the kids menu, then when the food got there we would switch plates. I would much rather go on a breakfast date than a dinner date, and I fully welcome breakfast for dinner any day! 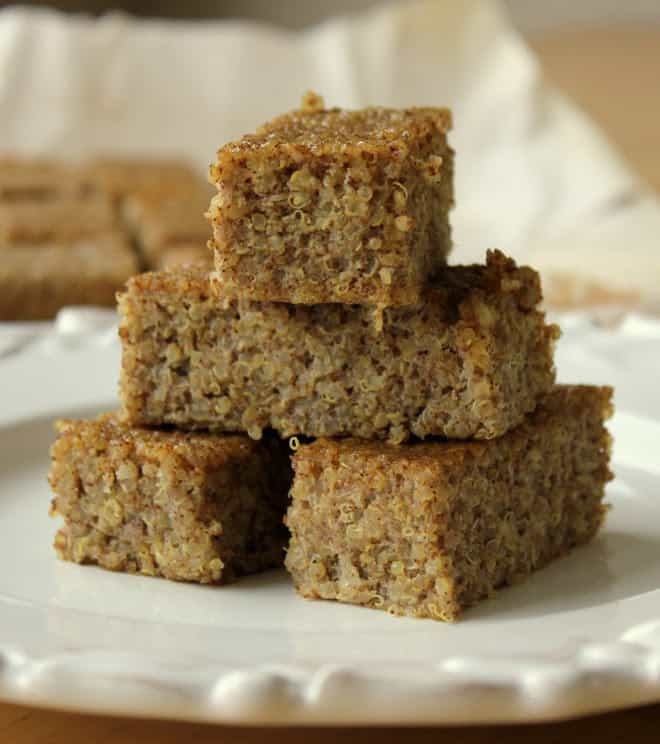 This cinnamon quinoa bake is great for a snack or for breakfast. A few years ago I made this amazing skillet quinoa bread, and have thought about it from time to time ever since. I need to tweak that recipe to be gluten-free one day. This bake reminds me of a sweet version of that bread. It also reminds me of delicious, moist french toast. 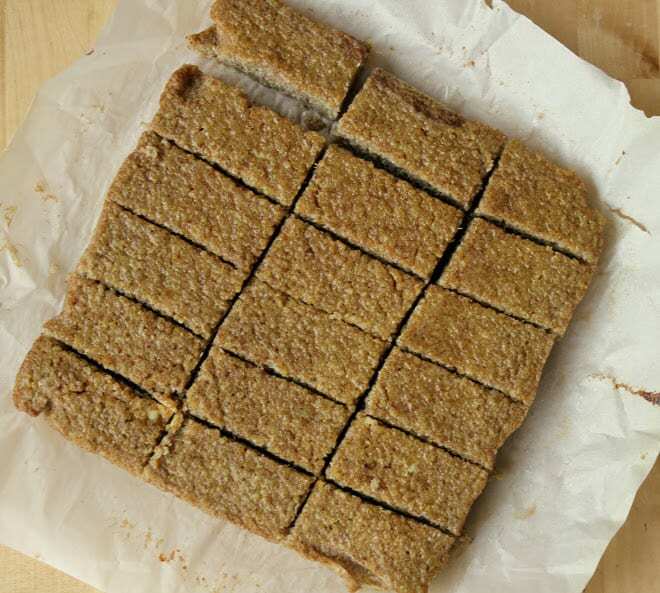 The little bars you cut up are definitely protein-packed and my little one loves them! You could serve this with fresh berries, jam, a nut butter, or nutella (I am always looking for vehicles for nutella..) and it would be great. The sky is the limit for modifying this recipe to your own tastes. It would be great with dried fruit, or with the maple syrup left out and switching it up with savory spices. 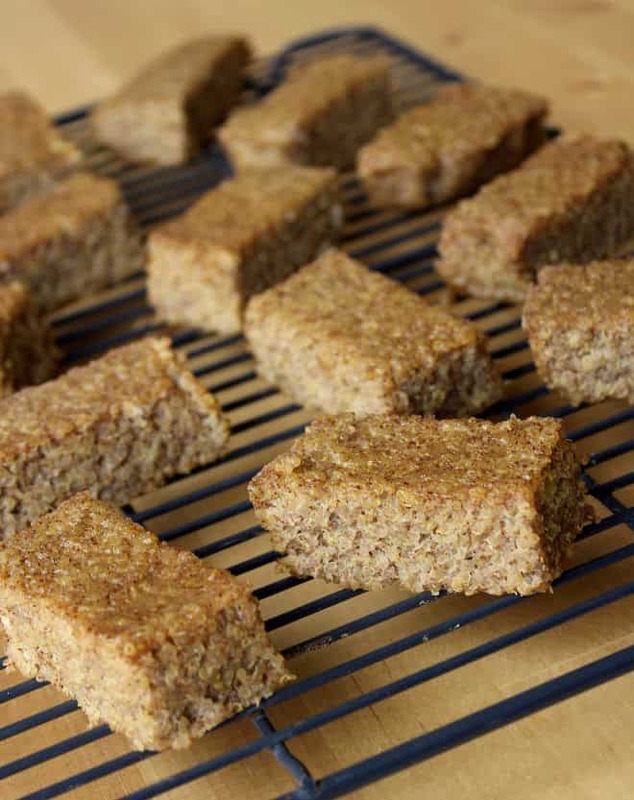 Cinnamon quinoa bars that taste like french toast sticks! Protein-packed and perfect for breakfast. Cook the quinoa by bringing 2 cups of water with 1/4 teaspoon salt to a boil, add quinoa then turn the heat to low and put on a lid for 15 minutes. Let it sit off the heat with the lid on for 5 minutes and fluff with a fork. Let cool to room temperature. 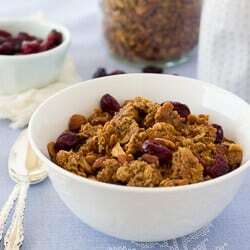 In a small bowl, whisk together eggs, almond milk, vanilla extract, coconut oil and cinnamon until thoroughly combined. Add maple syrup and whisk. Add egg mixture to cooked and cooled quinoa. Stir with a large spoon to combine. Pour into the parchment-lined baking dish and spread it around to ensure that itâ€™s even. Spinkle with turbinado sugar if desired. Bake for 20-25 minutes, until set and golden. Using parchment, remove bake from pan as soon as possible so that it doesn’t steam. Cool completely and cut into squares. Serve with berries, a dollop of nut butter, maple syrup or nutella. Enjoy! What a great idea – thanks! 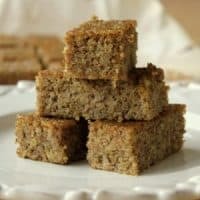 I am going to make these for my daughter who struggles to find something to eat for breakfast that is gluten free and not dry cereal or an egg! I just tried making these for breakfast, and came up with two things of note. 1 cup of uncooked quinoa created nearly 4 cups of cooked quinoa for me. It was a pretty full cup, but I definitely only used one cup per two cups water, like it said. Because of this, I measured out 2.5 cups of cooked quinoa for the recipe, and I think it didn't have enough quinoa in it. Did you pack it down to two and a half cups? or did it come to that volume while fluffy? Second point: it took 45 minutes to cook at 375 in a gas oven, and while cooked, looks quite different from your pictures above. Either way, when I make this again, I'm going to use the full volume of cooked quinoa. It was tasty, though! I just finished mowing down on 3 little squares I cut out, piping hot. I'm curious to see how it tastes when it cools. Also, did you find yours to be quite eggy? I use farm eggs, so it might have just been that, but I was curious to see. Thanks for the comment! Also thanks for pointing out the issue with the cooked quinoa. I think it does matter how you measure it once cooked (like if you pack it down or not). I will edit the recipe to instruct 1 cup of uncooked quinoa then add whatever volume that creates to the bake. I used the whole volume and think maybe that is why mine looks different than yours. I didn't find it overly eggy but I guess that depends on your taste! Maybe that would be remedied by adding more quinoa as well. Again thanks for your input! Quinoa tends to have a strong flavor and while I was excited about this recipe when I saw it, I was disappointed in the results. I think I will stick with recipes that use salty rather than sweet ingredients to complement the flavor of quinoa. If I tried this recipe again I might use butter in place of the coconut oil to add a little more saltiness or even up the salt amount. My family also had a hard time with the texture…perhaps adding nuts / dried fruit to the batter would help. We did serve it with maple syrup which definitely helped. The nut butter or nutella would have helped as well…just didn't have any on hand. In regards to some of the issues mentioned above I used the full amount of cooked quinoa that resulted from 1 dry cup. I did not notice an eggy flavor. I do agree however that the cooking time ended up being closer to 45 min than 20-25 min. Made these today! Mine took 27 minutes to bake but turned out beautifully…used raw milk instead of almond milk and honey instead of maple syrup. Yum! Can you refrigerated or freeze? curious if anyone has made using substitues for egg. We have to be egg free in our house. I am looking for healthier snacks for the kids but we have egg allergies. Thanks for any input! I substituted 1/4 cup applesauce + 1/2 teaspoon baking powder per egg and it came out wonderful!! Highly recommend this. Delicious. I also used agave nectar in place of maple syrup. Awesome!! Could you give me the breakdown of nutritioonal analysis, such as calories, fat, etc. Mine is in the oven now and looks like it will have taken closer to 45 minutes to bake rather than 25 like the recipe states. I absolutely LOVED these!!! Going to be a new staple. These are great! I did made a few changes that proved work well. First I added the cinnamon to the quinoa while it was cooking so the flavor would be balanced Then I substituted half the eggs with flax meal, added a tablespoon of chia seeds & 1/3 cup of sliced almonds. Next time plan to also add some dried fruit. I like the flax meal idea because I found them a little eggy too. Can you give me an idea of quantity of flax meal? Also, how dry should they be – like a cookie or more like a muffin? Hi there! 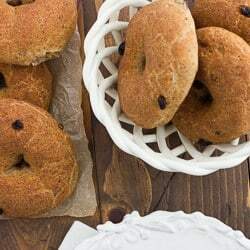 I am about to make these and was wondering if I could add blueberries before baking and also, how do they hold in the fridge or freezer? Thanks! Google each ingredient, total up the ones you care about then divide each one by the number of servings. I usually google “carbs in 1/4 cup of X” and get several options with full nutritional values. Hope this helps. First, I added frozen blueberries, sauteed with a little nonsalted butter, cinnamon, nutmeg, and a hint of coconut palm crystals sweetener, to my quinoa and cooked as directed. Also, I swapped out the maple syrup for 1/3 cup of peanut butter/almond butter blend. I did have to cook it longer than directed, bout 30-35 mins in electric oven. I like it!! Great lifestyle change without having to give up everything yummy! I am going to try these, I eat Quinoa all the time mixed with veggies. I love the suggestions except the Nutella, to keep this a healthy snack I’d avoid that all together. There are other “better for you” Hazelnut/Chocolate combinations that have much better ingredients. 🙂 This looks like a fabulous recipe, thanks for posting!